CLICK TO BUYBuy your Exide Battery/ Inverter Online. Enjoy free doorstep delivery and the assurance of authentic batteries. CALL TO BUYCall to buy your Exide Battery/ Inverter. Get professional advice, free doorstep delivery and other benefits. REGISTER YOUR BATTERYRegister Now to Avail 6-Month Extended Warranty! Ensure that vehicle battery and battery for jump-starting have the same declared voltage (say 12V). Turn off all electrical loads, check vehicles - no part should be touching each other and gear should be in neutral position. Vehicles should have the same terminal earthed, if not,refer to manufacturers' instructions. Make sure that cables are not frayed or damaged. Connect the positive terminal of jump-starting battery to the positive terminal of the stalled car battery - on negative grounded system. Connect one end of the other cable to the negative (-) terminal of the booster battery. Connect the other cable away from the battery, to the engine block or car frame of the vehicle to be started. Make sure cables are away from fan blades and other moving vehicle parts. After starting, remove cables in reverse order, starting with one connected to engine block or car frame. If vehicle does not start within 30 seconds, call an auto electrician. If the weather is cold, the engine may take the time to warm up. Be sure to check the grade of oil once. 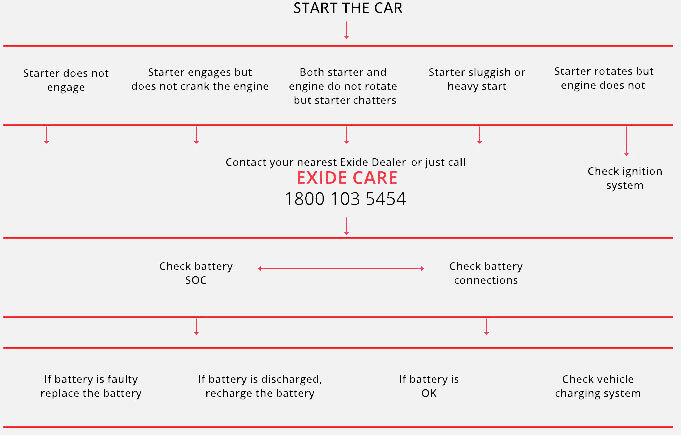 Or else, check your battery connection - in case of any problem, contact your nearest Exide dealer or Bat Mobile Service. Replace your vehicle battery, if it is faulty or recharge if it is low on charge and check fan belt and alternator output. Don't forget to test operating conditions. However, if battery function is smooth, check the starter motor and its connections.